Posted Apr 24, 2018 by Eds. 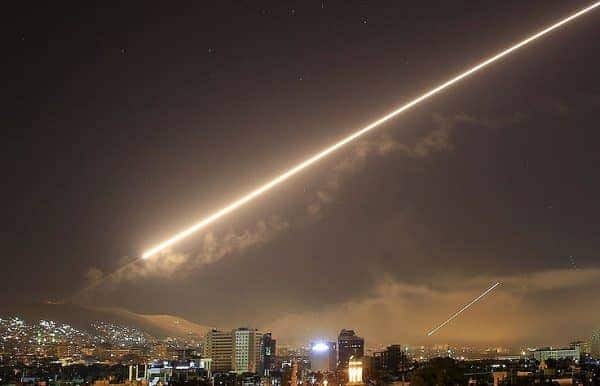 I believe that the U.S., UK, & France did the right thing by striking Syria over chemical weapons. It will not stop the war nor save the Syrian people from many other horrors. It is illegal under international law. But it at least draws a line somewhere & says enough. Some aspects of this point are more persuasive than others. For example, the unlawfulness of the strikes both in regards to international and, to a lesser extent, to U.S. constitutional law is difficult to contest, and the USA in particular has not even tried to articulate a justification under international law, even though its language is reminiscent of invocations of armed reprisals. Moreover, as critical legal scholars we are comfortable with the idea that the international legal order is not a just one. However, our agreement with Slaughter ends here. Putting aside the fact that none of the powers involved has invoked anything resembling civil disobedience as a justification, or conceded they were illegal while insisting on their legitimacy, if we do think about the justification as a form of civil disobedience, just how does the analogy fit at all? Are the U.S., the UK and France—all three permanent Security Council members with veto powers—oppressed and hampered by the (legal) inability to use force? Is Russia’s veto-power now implicitly constrained by whatever the U.S., UK and France say is civil or acceptable or moral? Which laws, rules, legal structures or principles impugned are liable to be civilly disobeyed? Is the morally unjust legal order here the UN Charter system—and is it unjust as a whole, or just in this specific way and in these circumstances; unjust insofar as it does not stop injustice? And given the old problem of the lack adjudicating sovereign at the international level—that no state is in the position as judge of the rights of others, or the punisher of transgressions like using chemical weapons on civilians—then who exactly is being disobeyed? And who gets to be a dissentient, civil or otherwise: could the Syrian Army claim disobedience from the norms prohibiting the use of chemical weapons, or those that protect civilians, perhaps on a claim—not infrequently invoked by the U.S. military—that civilians, children with ‘potential hostile intent’, or ‘military-age males’ can all provide material support to the enemy, and can be legitimate targets? To sum up all of these points in a more polemical way: can we think of a Tomahawk missile like we think of Rosa Parks? Needless to say, the legal and political label reserved for individuals who perform ‘civil disobedience’ by violent means is ‘terrorist’ with all the legal inconveniences this carries. Non-violence and a willingness to accept legal punishment are, after all, definitional of civil disobedience and inseparable from the moral appeal it has for many. Injustice and immorality is shown by the working of a legal system and the injustice of the punishments it inflicts on the disobedient; the rightness of civil disobedience lies in that demonstration, not in its illegality. Most importantly, killing is not and can never be read as a refusal to obey unjust laws. It may find its justifications—in revolution, in resistance, in self-defence—but it is rightly not seen as a form of disobedience. Anthropomorphisation has been prevalent in the discipline at least since the 19th century. It relies on what is commonly described as the ‘domestic analogy’: the idea that there is some fundamental homology between the position of individuals in domestic legal systems and that of states vis-a-vis international law. This intellectual manoeuvre performs a number of important ideological functions. It legitimises the international legal order by rendering it commensurable and familiar to domestic political and legal authority. It reinforces the liberal, contractual perception of (domestic) politics by pointing at an order where the ‘state of nature’—with its barbarians, lawlessness and dispositions towards wars of all against all—purportedly still exists and needs to be confronted with on a daily basis. It insists that state choices are just like individual moral decisions, or decisions of domestic policy. Much mainstream discussion of international law issues often boils quickly down to the kind of language Slaughter uses, especially in regards to humanitarian intervention. Questions of imperialism, past and present, are waved away, and so are analyses of the structural roots of conflict and atrocity. All that is left from this act of abstraction is the (intervening) state as a conflicted—yet potent—individual actor who struggles to put an end to the moral tragedy that is unfolding before his eyes. In this context, as Susan Marks has argued, only arguments against intervention are cast as state-centric, while pro-interventionists fashion themselves as representatives of progressive values and humanity. In fact, what pro-interventionists argue for is the right of one sovereign state to use its organised military force in the territory of another provided that it can assert humanitarian motives. Therefore, what is in reality an argument about ‘which sovereignty to prefer’ appears as a battle between morality and sovereign authority. In other words, something not too far from civil disobedience. As part of that resistance, we might want to ask the burning question Slaughter raises, albeit only inadvertently. What would a real civil disobedience—through, in and of—international law, actually look like? We have no easy answers to this question, but there are some directions worth exploring. A first is to recognise and resist the anthropomorphisation of the state, and to insist on talking about the structures—international and domestic, historical and contemporary—that we might try to resist, dismantle, and disobey. A second is resignations and refusals, official or not: to recover a tradition of office holding where fidelity to justice means a refusal to take part in things that debase it, of refusing power without responsibility, as advisors, academics or public commentators. For a classic example of this approach see: Hersch Lauterpacht, Private Law Sources and Analogies of International Law: With Special Reference to International Arbitration (Longmans, Green and Co. Ltd.,1927).